We take a look at the best VPNs for streaming your favorite content from any location without compromising speed or your privacy. Whether you want a VPN for Netflix, live streaming sports, or Kodi, we've got you covered. Only a few VPNs have what it takes to unblock streaming video on sites like Netflix, Hulu, Amazon, HBO, BBC and others. These sites and apps block most VPNs, but we’ll show you the best VPNs for streaming that still work in 2019. All of the VPNs we recommend also work well with Kodi. Torrenters should see our separate round up of the best VPNs for torrenting. ExpressVPN The one to beat. 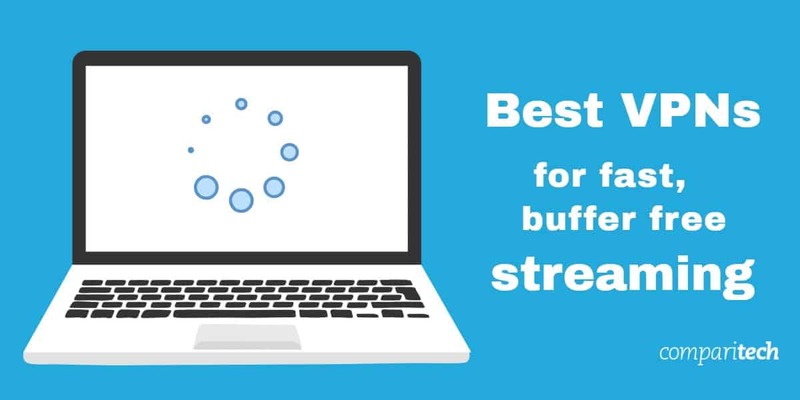 Super fast servers dotted around the globe deliver high-quality buffer stream streaming. Best-in-class privacy and security and apps for all devices. Includes 30-day money back guarantee. NordVPN A budget choice with a large network of servers that manage to hit good streaming speeds without compromising on security or privacy. CyberGhost Great value with good streaming speeds. Ease of set up and use makes for a decent beginners’ favorite. VyprVPN Strong security, good speeds, and unblocks US Netflix. Owns its own data centers. PrivateVPN A new entrant to the VPN market that works well with streaming services. IPVanish Good speeds and privacy features. Popular with torrenters and Kodi users. Unblocking sites from abroad like Netflix, Hulu, Amazon Prime Video, and BBC iPlayer is one of the most popular reasons to use a VPN. Short for Virtual Private Network, a VPN allows you to bypass the geographic restrictions on sites and apps like these, which only allow you to watch while in a certain country. By masking your real location with that of the VPN server, a streaming VPN makes it seem as though you’re accessing the streaming service from the US, Canada, UK, or anywhere else a server is available. A VPN also makes it possible to bypass blackout restrictions on live sporting events. Unfortunately, many streaming sites and apps have caught on to this tactic and banned VPN users from accessing their websites, apps, and Kodi addons. ExpressVPN is a long-running champion of unblocking video streaming services online, although it doesn’t openly advertise its capabilities. Because of that, it’s not very obvious which servers users should connect to. We won’t post them here because they occasionally change and we don’t want to draw undue attention to them. Instead, users will have to contact customer service to ask which servers to connect to for which streaming service. Luckily, ExpressVPN has a live chat service on their website that rarely keeps customers waiting for more than five minutes. They are professional staff who know the product well. They might ask you to prove that you are a real customer and not a shill for Netflix by asking for the email address under which you signed up for an account and the last server you connected to. Once you’ve passed the test, you’ll be given a shortlist of servers that should bypass the firewall. Apps are available on Windows, MacOS, iOS, Android, Amazon Fire TV, Linux, and certain wifi routers. You can connect three devices at once. BEST VPN FOR Streaming:ExpressVPN is our #1 choice. Blazing fast and a reliable choice which unblocks all major streaming services including Netflix, Hulu, and Amazon Prime. Great privacy features and keeps no logs. Try it risk-free with the 30-day money back guarantee. NordVPN is the only other provider to perform on par with ExpressVPN. It, too, unblocks pretty much everything but requires knowing which servers to connect to. We recommend heading to the NordVPN knowledge base and simply searching for the streaming video service you want to unblock. In the appropriate page, NordVPN maintains a list of working servers. You can toggle those servers as favorites in the app to make them easier to find later. NordVPN is great for users who want to watch a Netflix catalog outside of the US. We’ve successfully tested it with Netflix US, UK, Australia, Brazil, Italy, India, Netherlands, Spain, and Germany. Apps are available for Windows, MacOS, iOS, Android, Amazon Fire TV, and Linux. You can connect up to six devices at a time. BEST BUDGET VPN:NordVPN is a great value option. Good HD streaming speeds. Strong security features and allow up to 6 devices to be used simultaneously from one account. 30-day money back guarantee. CyberGhost recently ramped up its unblocking efforts to make more streaming services available to its users. It works with all of the websites tested. The app has a dedicated “Unblock streaming” section where you can choose a server according to the streaming service it unblocks. Not all of the ones we tested are on that page, but we were able to unblock them nonetheless. For example, Hulu isn’t listed, but the Netflix server was able to unblock it, anyway. Things are looking up for CyberGhost subscribers, but bear in mind this is a fairly recent update, so we’ll see if it holds out. Live chat support is at customers’ disposal on the website, but only during business hours. A ticket submission system replaces it during off hours. Apps are available for Windows, MacOS, iOS, Android, and Amazon Fire TV. You can connect up to seven devices at the same time. Great Value:CyberGhost is great for beginners Streams HD video reliably. Works well with Netflix but not so well with other popular streaming sites. 45-day money back guarantee. VyprVPN has recently re-emerged as a strong candidate for best overall unblocker. A few months ago customers had seemingly lost hope of it ever being able to unblock Hulu again. Quite recently, however, it was able to unblock everything in our tests, including the Netflix and Hulu apps. We’ll monitor it in the coming weeks to see if it can sustain its success, but for now, it stands among the heavyweights like ExpressVPN and NordVPN. We didn’t test every server on VyprVPN, but we can confirm that the New York server was effective in unblocking all streaming channels. Apps are available for Windows, MacOS, iOS, and Android. Five simultaneous connections are allowed. UNLIMITED DATA USAGE:VyprVPN is easy to use. Excellent speed and uptime as all servers are owned by VyprVPN. Not the cheapest option. 30-day money-back guarantee. PrivateVPN is a small new provider that’s making a big splash in the VPN market when it comes to unblocking Netflix. We’ve been able to unblock Netflix in pretty much every country we’ve tested so far, including the US, UK, Italy, Brazil, and France. PrivateVPN unblocks Hulu in both a browser and on the app, though the number of servers that unblock Hulu is a bit more limited. We had to ask customer service which server to connect to. A live chat service is available, but unfortunately, it is not available 24/7. You can submit a ticket during the off hours. PrivateVPN offers up to six simultaneous connections on a single account, making it a great bargain. Apps are available for Windows, MacOS, iOS, Android, and Fire TV. Great Speeds:PrivateVPN good family choice. Unblocks Netflix. Good for HD Streaming. Could do with having more servers and lacks 24/7 support. 30-day money back guarantee. IPVanish seems to be struggling to unblock the most popular streaming services as of late. It failed to unblock Hulu and Netflix altogether in our tests, despite a support ticket we submitted suggesting otherwise. Still, users can still watch Planet Earth and Game of Thrones on HBO Now and BBC iPlayer. IPVanish scores highly for protecting privacy and speed so if you are interested in a VPN for torrenting or a VPN that works well with Kodi it is a very good choice. Apps are available for Windows, MacOS, iOS, Android, and Amazon Fire TV. UP TO 10 DEVICES:IPVanish is great for families. Handles several simultaneous connections well. Recommend for their high standard of privacy, but keep shopping if you want to unblock Netflix. 7-day money back guarantee. What about all the other VPN providers? There are of course dozens of VPN providers, but only a handful have solid track records of being able to reliably unblock streaming channels like Netflix and Hulu. For this reason, we’ve excluded VPNs that do not and probably will not feature such capabilities. This includes the vast majority of free VPNs. However, if you subscribe to a VPN service that reliably unblocks the streaming services above, let us know in the comments and we’ll consider adding it to the article. If you’re logged into any Google accounts, including the one on Chrome browser, log out of them.Google caches IP addresses, which can reveal your actual location. Disable GPS and any other location services on your computer, smartphone, or browser. If you’ve given Netflix permission to see your location in the past, you’ll need to toggle this off in your browser settings. Change your device’s time zone to the country’s in which you’re trying to access Netflix. When your device sends a web page request, most secure VPNs force those requests onto the IPv4 protocol. But some apps and websites can force requests to be sent on all possible channels, which results in a mismatched location exposing the use of a proxy service such as a VPN. Hulu and Netflix both use this tactic to weed out VPN users. To get around this, a simple solution is to disable IPv6 on your device altogether. You might have attempted to access Hulu or BBC iPlayer in a web browser in the past and encountered an error due to being outside the country or using a proxy. The website in question could retain such information in a cookie or browser cache and continue blocking you even though a VPN is enabled now. If you’re connected to a working VPN but still get the proxy error message, then try wiping clean your browser cache, hosted app data, and cookies. In the command prompt (black window), type ipconfig /flushdns and hit Enter. Reconnect to the VPN, refresh the Hulu page, and enjoy the video! Click on the Configure IPv6 pop-up menu and select Off. Click OK and Apply (to apply the change). Go back to the video and refresh the page with the VPN enabled. You will be prompted to log in again. After that, the video should be accessible. Enjoy! Exit FireFox and re-open the browser. Navigate to the video page and log in again. Enjoy the video! What’s the difference between watching Netflix or Hulu in a browser and watching it on an app? Netflix and Hulu are less likely to be geo-blocked on a browser than in their respective apps. This is because an app can override a VPN’s DNS settings and force DNS requests to go to the nearest DNS server. When the location given by the user’s IP address and their DNS server don’t match, a proxy is detected and the video is blocked. DNS, or domain name system, works sort of like the internet’s phone book. Every internet connected device on the internet is assigned a unique IP address. Websites and apps usually have domains, however, such as “www.comparitech.com”. Translating an easy-to-remember domain into a usable IP address is the job of DNS servers. DNS servers are usually run by ISPs and public providers like Google. Most good paid VPN services operate their own DNS servers, which assists in location spoofing. In a browser, the Netflix and Hulu websites have no power to change the VPN’s DNS settings. An app, however, can override the VPN’s DNS settings and reveal a mismatch between the IP address location and the DNS location, indicating that the user is connected to a VPN. Very few–ExpressVPN, VyprVPN, and NordVPN–have figured out how to combat the Netflix and Hulu apps’ DNS override mechanism. We only included tests for the US version of Netflix due to time constraints. There simply isn’t enough demand for us to test every VPN with every country. We may consider adding a few more countries at some point in the future. 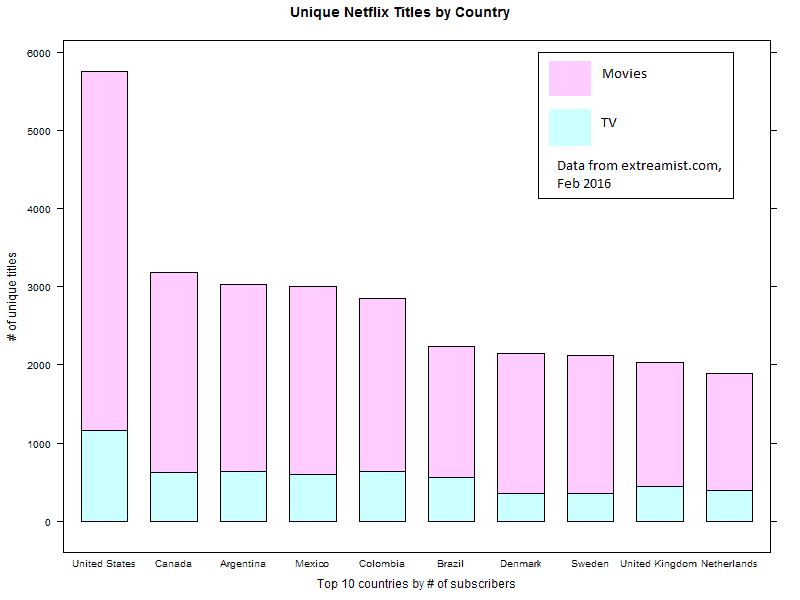 Netflix US has the largest catalog of new TV shows and movies that are in high demand, so it is by far the most requested country to test. Keeping track of which servers work on which VPNs isn’t just a one-off task, either. The services in this article, including US Netflix, we check regularly. Netflix frequently blocks VPN servers, so staying up to date on multiple countries could soon accumulate to be such a huge task that it would require hundreds of hours. Update: We now have separate articles for unblocking Netflix with a VPN in other countries, including Italy, Brazil, and Spain. ExpressVPN, NordVPN, VyprVPN, CyberGhost, and PrivateVPN are at the top of their game when it comes to unblocking geo-locked content. They are the only VPNs we know of that can unblock Netflix US both on a browser and when using the Netflix app. They can also both unblock Hulu, which has some of the most robust anti-VPN barriers in our experience. Do not buy a subscription and simply expect any server to work, however. The range of servers that can unblock Netflix, Hulu, BBC iPlayer, and HBO Now–even in a web browser–is very limited. For example, we recommend you contact ExpressVPN’s live customer support to ask which servers currently work with the streaming site you wish to access. NordVPN users can consult the knowledge base on the company website. Typically, only a handful of servers will be able to bypass a firewall at any one time. Why use a VPN to stream on Kodi? Just like streaming websites and apps, official Kodi addons are often geo-blocked. By connecting to a VPN server in another country, your real IP address is masked by the VPN server, so the streaming source will see the server’s location and not yours. We advise using a VPN with Kodi even if the addon you’re using isn’t geographically restricted. Even if a Kodi addon is used to access an official stream, the addon itself might not be official (e.g. the iPlayer WWW addon for BBC iPlayer). An addon that’s safe one day could be modified to be malicious a day later. A VPN will help protect against many common threats to Kodi users, including man-in-the-middle attacks that attempt to steal login credentials. Finally, a VPN protects your privacy so that third parties can’t monitor what you watch, including your internet service provider. 14 What about all the other VPN providers? 16 What’s the difference between watching Netflix or Hulu in a browser and watching it on an app? 17 Why only US Netflix? 19 Why use a VPN to stream on Kodi? 8 What about all the other VPN providers? 10 What’s the difference between watching Netflix or Hulu in a browser and watching it on an app? 11 Why only US Netflix? 13 Why use a VPN to stream on Kodi?